Recently I came across a very insightful article, written by Vani (food babe), talking in great detail about bread. I love bread and always on the look out for the healthiest version on the market. This article was so interesting that I had no choice but to share it, so you can make better decisions as to what kind of bread is best for your body and your health. It is time to address the many questions I get about one of most wonderful and satisfying foods on earth is Bread! I don’t want to live without it and you shouldn’t have to either. Bread is a really hot topic and is targeted as the root of many health problems. Overall, bread gets a bad reputation because grains are not easy for your body to digest, can overwork your pancreatic enzymes, contain the anti-nutrient phytic acid and an abundance of dreaded gluten. Also, our wheat crops in this country have been through some serious genetic manipulation to make them profitable for the food industry and less healthy for us. The main problem with wheat (unless you have a gluten sensitivity) is that we as a culture eat too much of it in general. Additionally, commercially available grain-based products that line grocery store shelves and are served at restaurants are unhealthy. They are full of ingredients that are not food, like azodicarbonamide (the same chemical in yoga mats and shoe rubber), other chemical dough conditioners, added sugars, artificial flavorings or coloring and GMOs. Flour can be treated with any of the 60 different chemicals approved by the FDA before it ends up on store shelves, including chemical bleach! Also, the industrial processing destroys nutrients, such as Vitamin E and fiber. Remember, it only takes 4 ingredients to make bread: flour, yeast, water and salt, there is really no need for all that other nonsense. 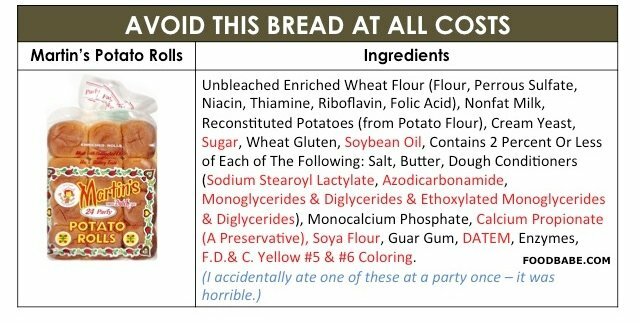 If you are like me, you probably want to enjoy the occasional piece of bread without subjecting yourself to of all these questionable ingredients. I have done a lot of research on bread brands, and have uncovered what can make grains really unhealthy and which ones make a nutritious addition to any diet because they are whole, unadulterated and real foods. Please note: Natures Own Bread recently took out azodicarbonamide, but is still not recommended. The picture of ingredients was removed after this news release in WSJ on 2/28/2014. Dough Conditioners these are unnecessary in traditional bread making and only make the process faster and cheaper for the food industry to make bread in big machinery. Many dough conditioners like azodicarbonamide(which is banned all over the world), DATEM, monoglycerides, diglycerides, sodium stearoyl lactylate are linked to health issues. Many dough conditioners start with manipulating fat like soybean oil or corn oil, which is also most likely GMO. Natures Own, Arnold, Wonderbread, Martins, Sara Lee, and many other popular brands are guilty of using dough conditioners. Preservatives Bread is supposed to be fresh and eaten within a few days from baking unless frozen. If you see preservatives like calcium propionate, which is linked to ADHD, put the bread down and keep searching. Warning: Pepperidge Farm uses this ingredient to retard spoilage. 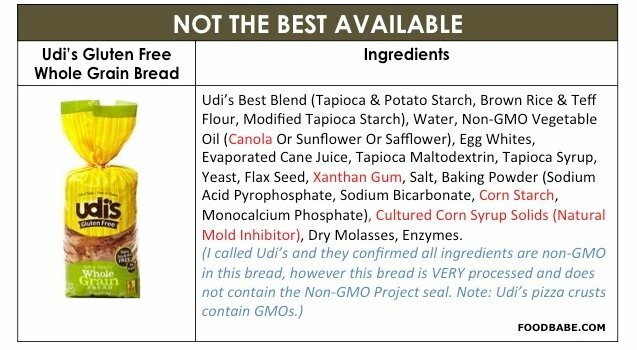 GMOs Most commercially available breads contain one or many genetically modified ingredients like soy lecithin, soybean oil, corn oil, corn starch or soy flour. GMOs have not been tested long term on humans, however we know that the pesticides sprayed on them are absolutely toxic and considered to be poisonous. Some GMOs are created by inserting a toxic pesticide into the seed itself to make an insects stomach explode when they try to eat it. Added sugar This is where you really need to watch out. There’s nothing wrong with a little honey to bring out the sweetness in whole wheat bread, but most manufactures are using high fructose corn syrup, GMO sugar made from sugar beets, or some other artificial sweetener like Sucralose that are not the best forms of sugar and can pose health risks. Almost all commercially baked brands have some form of added sweetener especially watch out for light breads, which often contain more added sugar like Arnold Bakery Light. Artificial flavors and coloring These ingredients are made from petroleum and are linked to several health issues like hyperactivity in children, allergies and asthma. They are easy to spot on the label because the FDA requires it. However, ingredients like caramel coloring can fool you into thinking this ingredient is a real food. Most industrial caramel coloring is created by heating ammonia and is considered a carcinogen when created this way. Martins potato rolls have Yellow #5 and Yellow #6, and Thomas English Muffins have caramel coloring. 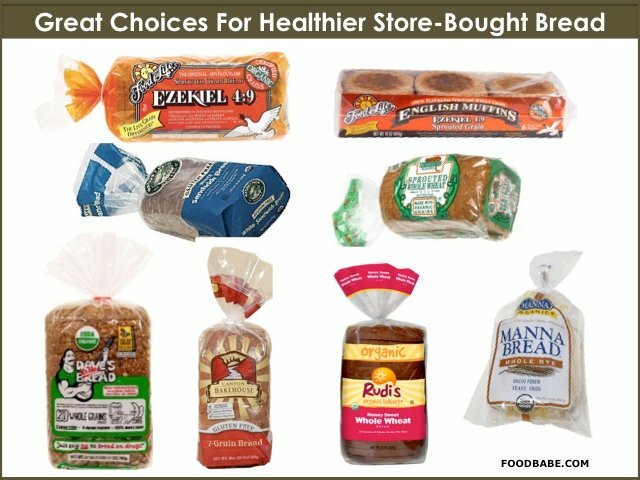 There are many healthy bread options available if you just know what to look for! Sprouted Grains love sprouted grains because they are technically vegetables. To sprout a grain, you just soak it until it begins to sprout into a little plant. These sprouts are then ground up to make bread. When you eat a grain that has been refined into flour, your body quickly metabolizes it like a sugar, which causes your insulin to spike. This can make you gain weight and contributes to diabetes and inflammation. 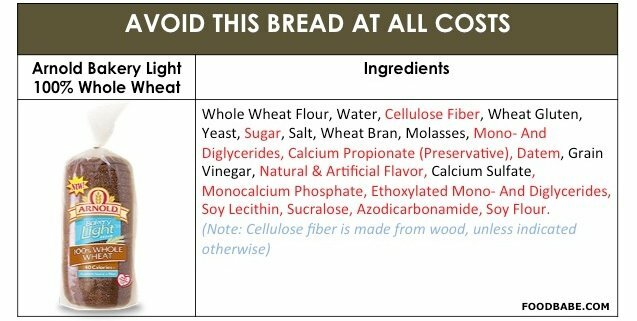 For all of these reasons, I don’t buy bread that is primarily made from flours, especially wheat flour which is really just white refined flour. The sprouts are much more easily digested than starchy flour, and contain more vitamins, minerals and antioxidants than whole grains. Phytic acid is destroyed when the grain sprouts, so your body is able to absorb the nutrients in these grains which makes them that much better for you! My favorite sprouted grain bread is the classic Ezekiel 4:9 Sprouted Grain Bread by Food for Life made up from six different organic sprouted grains and absolutely no flour! This combo of sprouted grains contains all 9 essential amino acids, which makes up a complete protein. There are no preservatives in these breads, so I keep them in my freezer and take out portions as I need them. I also love the sesame seed bread, whole grain tortillas, corn tortillas and english muffins by Food for Life. Hands down they are the healthiest breads on the market. They are available in most health food stores and some conventional stores in the freezer section. Other good sprouted breads are Manna Sunseed bread and Daves Killer Bread Sprouted Wheat, which are both a healthy combo of organic sprouted wheat and seeds. Ancient Grains(spelt, quinoa, amaranth, millet, sorghum) & Gluten-Free. Unlike wheat, these grains are called ancient because they haven’t changed for thousands of years. They are packed with nutrients and many of these grains can be used to make gluten-free bread. Just make sure that the bread you are buying is labeled as gluten-free if you are trying to avoid gluten because not all ancient grains are gluten-free and they may be blended with wheat. Manna makes a good gluten-free bread with brown rice, sorghum, millet, amaranth, quinoa and chia seeds. Please note, almost all gluten-free breads contain added sugar in the form of honey, molasses, agave nectar or evaporated cane juice. Last but NOT LEAST Remember to always choose bread that is made with real certified organic ingredients. The wheat that is used to make most bread is heavily sprayed with pesticides and by choosing certified organic products you will avoid exposure to GMOs. Now, lets go break some bread with our loved ones and share this article with them. Everyone deserves good bread without chemical additives that can wreck their health. « Baking Soda » What is Micro-needling?